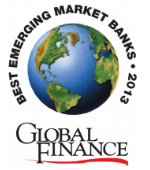 NEW YORK, March 18, 2013 — Global Finance magazine has named the "Best Emerging Markets Banks in Central & Eastern Europe" in an exclusive survey to be published in the May 2013 issue. Global Finance editors—with input from industry analysts, corporate executives and banking consultants—selected the best emerging market bank in the region and in 22 countries. Criteria for choosing the winners included growth in assets, profitability, strategic relationships, customer service, competitive pricing, and innovative products. This is the twentieth year that the magazine has selected top banking performers in emerging markets. The report covers best banks in Asia, the Middle East, Africa, Latin America, and Central and Eastern Europe. "Each region and individual country presents unique challenges for banks and their customers, especially under the difficult conditions global financial markets continues to face," says Joseph Giarraputo, publisher of Global Finance . "For this reason, customers must depend on excellence in execution from their banking partners. These are the banks that are providing best-in-class solutions for these distinctive markets."